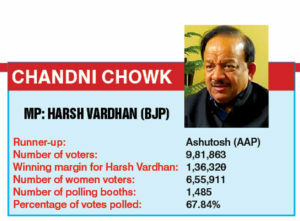 The Chandni Chowk Lok Sabha constituency is one of the major constituencies not only in Delhi, but the whole of India. 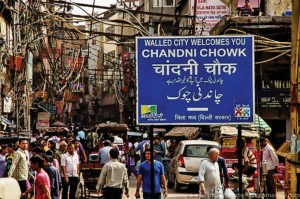 And at the heart of this constituency lies the Chandni Chowk Market — one of Asia’s largest retail markets — which encompasses four Delhi Assembly consti-tuencies: Sadar Bazar, Chandni Chowk, Ballimaran and Matia Mahal. Together, these localities form more than 40% of the total area of the Lok Sabha constituency. A walk through the main area, and one can see the jampacked markets, traders and shopkeepers inviting customers. The area that stretches from Jama Masjid’s Matia Mahal and Meena Bazar to Sadar Bazar echoes with the hustle and bustle of markets, and shopkeepers. Even the narrow gallis and the basement of old havelis house a number of markets. With traders forming the bulk of voters in the area, any economic reform made by the central government is bound to affect the area and perhaps make a significant mark in deciding the outcome of the elections. Since the formation of the Narendra Modi led BJP government, two of the most major economic reforms in Indian history has been introduced ­— the demonetisation of old currency notes and the imposition of the Goods and Services Tax (GST). More than two years since both of these economic reforms, Patriot visits the Chandni Chowk market and finds out what impact these have had on their trade and their lives, and whether the effects still continue to linger after so many years. “Before demonetisation, we used to sell a lot of our products,” says the owner of a silverware shop at Dariba Kalan. “But demonetisation and GST have completely washed our business down. Our earnings are half of what used to be,” he says. Also, he adds, that shops were completely shut for the first 20 days since the announcement of demonetisation, thus hampering the business at that time. Even after more than two years, the effects at his shop are very much visible. “This is where we keep articles that has not been sold for one or two years,” he says, pointing out to a section of his shop. “Earlier this never used to happen. People have reduced buying silver in bulk especially after these reforms,” he claims, adding that while before 2016 he used to have more than 200 corporate orders per year, and now he has got only five orders in the past two and a half years. In a shop near Kinari Bazar, where Rajesh sells decorative items and cloths for the past two decades, he says that his business is down by more than 60% than what he used to do. “Previously, during festive seasons like Diwali and Holi our sales used to be at peak — as high as Rs 15-20,000 per day but for the last two years it is a damp squib. We buy our goods for a certain amount of money, and with our sales, not only would we recover the amount, but our profit margins would be more than double,” he says. “But now, we hardly get any profit. Last year we hardly recovered our buying costs,” adds Rajesh. “I think this has mainly happened because now our products come under the GST slab of 18%. Before this, there used to be no tax on our products. As a result, our margin of profit has also increased,” he further explains. “The whole concept of GST is so confusing. There are so many technicalities. On top of that, the government introduces and amends the GST act every now and then and it becomes more confusing for us,” adds Shyam, another cloth merchant at Kinari Bazar, who has a shop right opposite to Rajesh’s shop. “I am not that educated to understand all the implications of the GST reform. To do that, you need to have a private accountant. Big retailers and traders can afford that, but a small shopkeeper like me cannot afford that,”, says Anish, who owns a small shop in one corner of Kinari Bazar. “The main purpose of the government behind demonetisation was to promote digital payment,” says Manoj Kumar, a cloth merchant. “Now, we hardly use digital payments, and small-time traders don’t use them at all. This is mainly because internet systems here hardly work,” he adds. 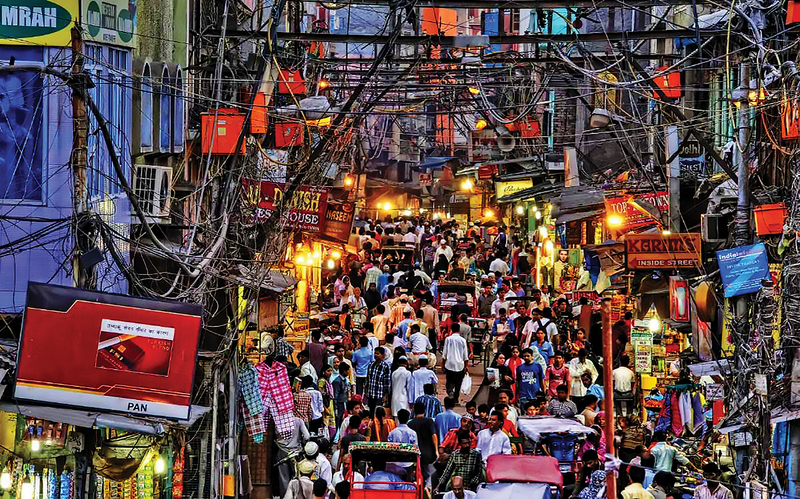 “None of the phone networks work here, and this is the same throughout Chandni Chowk,” he adds. “Add to this the availability of cash in the market – which has gone down drastically, and so many customers are now used to digital payments. But since most of us don’t use such apps, it creates big losses for us, traders of Chandni Chowk,” says Kumar. Like the above merchants, almost all the traders we spoke to had the same story to tell. There was not one person, whose trade was possibly affected by demonetisation and GST in a positive way. However, most of the people still have faith in the current government. “Yes, we have incurred losses, and both GST and demonetisation were not implemented properly, but like our Prime Minister has said, that this is for the greater good of the nation. I am willing to sacrifice my livelihood for the greater good of the nation, “says Lal Kishan Jaiswal, a carpet trader. Sari shop owner Sanjay Devar says that GST and demonetisation are just two small mistakes by the government, which has done so much for the nation. “If there were 10 members in my family and two of them were bad, and the rest are good, does it mean that my whole family is bad?” he questions. Office secretary of the Hindustani Mercantile Association, Dharam Nath, says that both GST and demonetisation were positive steps by the government. “At least our Prime Minister had the guts to impose a bold decision to remove corruption from our country. And to do so, the lives of some traders are affected in a very small way, that should not be something to complain about,”he says. So, will the loss in these traders ‘business have an effect on the upcoming elections? Or will some of their support for the government despite the adverse effects of GST and demonetisation prevail? The answers can only be found out once the counting on 23rd May is finished.